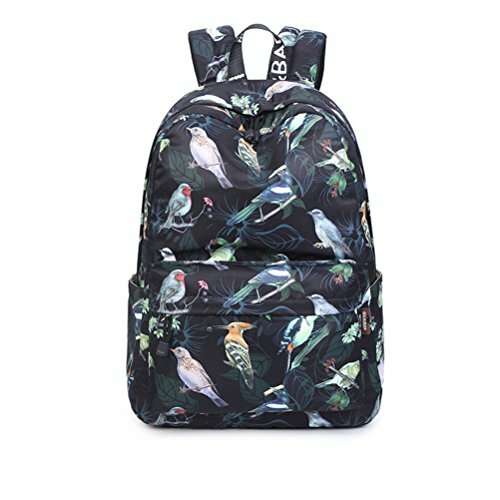 Material: High quality waterproof canvas+Polyester Lining: This lovely cute school backpack is retro and vintage style and with classic academy style design. The school bag is reliable, well built, classically designed and the construction is great. It is a great size bag for school and college girls carrying laptop, books and other necessaries for classes. The inside is lined with fabric material. The main compartment can put books, magazines, sunglasses, headset, etc; the laptop compartment can put a computer up to 14''; two small pockets can put your cell phone and small stuffs easily; an inside zipper pocket can put confidential stuffs; A front zipper pocket can put an iPad or iPad Mini; two side pockets can place your cell phone, bottle, umbrella, etc. The rural style design brings a taste of pastoral life. It has a unique exterior. Flower and animal printed canvas bag with fresh and fashionable floral pattern, which is very attractive and eye-catching. If you have any questions about this product by Winerbag, contact us by completing and submitting the form below. If you are looking for a specif part number, please include it with your message.